Even though rustic furniture looks effortlessly cool, it usually runs for a pretty hefty price tag. One of my favorite rustic-looking furniture trends is reclaimed wood, but unfortunately, that’s always expensive, too. One piece in particular that I’ve always wanted is a reclaimed wood headboard. Some of those run for upwards of $1,000, and I don’t know about you, but I am not spending that kind of money on a headboard. Instead, I found this DIY for under $50. Not only does it look just as good as the expensive ones, but it’s super cheap and easy to make. I couldn’t believe the final product once I saw how this was done! First, lay out half of your wood sheets and stain them one of the two colors. Wipe off any excess with a paper towel, and vary the amounts you put on. You want this to look rustic! Repeat this process with your other wood sheets. Now, lay out your wood sheets on the canvas. You’ll saw off pieces of some wood sheets to fill in the gaps. Be sure to mix up the colors! Use your industrial glue to stick the wood sheets on the canvas, and use your black marker or paint to fill in the gaps. Once you cover the edges (or don’t, it’s your headboard,) you’re done! 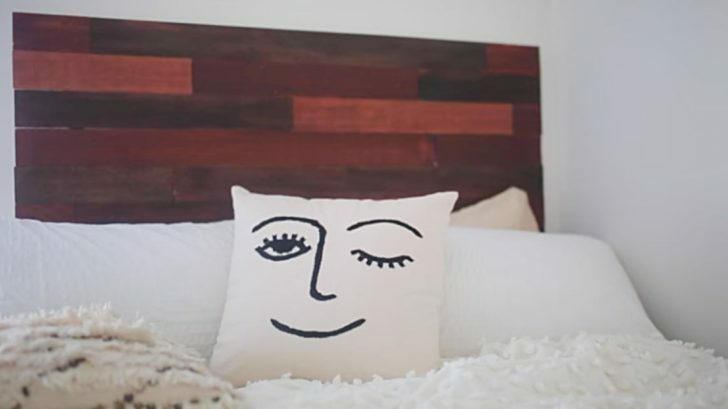 Watch Nastasza’s video below for an easy-to-follow visual on how to make this headboard. You won’t believe how easy it is!